Previous posts on Climate and Capitalism (here and here) discussed Ecuador’s proposal to halt development of oil reserves in the Yasuni Park in the Amazon region if it received international compensation. Here’s additional background, prepared by an advisor to the Ecuadorian government. Yasuni in Ecuador: An Initiative from the Southby Joan Martinez-AlierIn September 2007 the president of Ecuador, Rafael Correa, reaffirmed his decision not to pump some 920 million barrels of heavy oil in the ITT block of the National Park of Yasuni in the Amazon. The main motivation behind this proposal is the defense of the culture, the livelihood and the rights of the indigenous people who live in this patch of the Amazon forest, as well as the preservation of the unique biodiversity there. You cannot put a price on such things. The avoided carbon emissions are an added bonus. This proposal is no different than campaigns to prevent the extraction of crude in the wildlife refuge of Alaska, or to limit the fishing quotas in the Galapagos islands — the (rational) sacrifice of monetary profit for the greater good of preserving (irreplaceable) natural and cultural heritage. For Ecuador, leaving the oil in the ground represents a large opportunity cost (lost opportunity) in a financial sense, one that, some argue, a poor and indebted country such as Ecuador cannot afford to take. However, there are convincing economic arguments for an indefinite moratorium on oil extraction in the Yasuni because the real costs of oil extraction (many of them invisible in financial terms), are probably greater than the benefits. Firstly, ITT oil is a heavy crude which would be difficult and expensive to extract and to pump over the Andes, and which and produces many barrels of polluted water for each barrel of oil. At the same time it is worth less on the market than light crude. Secondly, extraction creates local “externalities” including air and water pollution, deforestation and the loss of biodiversity, as well as threatening it the livelihood, culture and health of the indigenous Huaorani. Such costs are not easy to translate into money terms but they are very real, and often irreversible. As well, deforestation, an unavoidable byproduct of oil extraction because settlers follow oil, would increase global greenhouse gases. Avoiding deforestation, particularly of old growth forests, is one obvious way to fight climate change. Thirdly, the extracted oil will finally be transformed into carbon dioxide and released into the atmosphere, contributing to global emissions of CO2, currently growing at a rate of more than 3 per cent annually rather than decreasing as they should be. Ecuador holds almost no historic responsibility for global climate change and is not forced under international accords such as Kyoto to reduce its output of greenhouse gases. Despite this the government wants to do its part to reduce carbon emissions and is leading with an initiative from the South. The rich countries produce significantly more greenhouse gases per capita than those that would justly correspond to them. In the process they are essentially transferring the costs of climate change to the poorer countries and to future generations. This is a fact that the industrialized countries ignore at their own peril — and it could soon grow into an international relations problem that cannot be ignored. Although Ecuador bears no responsibility for global warming, the President is taking a stand on the issue, saying: we do not want the environmental debt to mount any further. We want to halt the accumulation of the ecological debt. On July 14, 2007, The Economist magazine reported that the melting of the Andean glaciers will cause problems with the water supply. No one is offering to compensate Ecuador for this impact. No, rather than work towards repaying the ecological liabilities, the rich countries are offering the poor southern countries “adaptation” loans to deal with climate change-related risks. Eventually, to repay these loans, countries such as Nigeria, Bolivia and Peru will be forced to export ever more oil and gas to pay down their debt. The South must become a protagonist and a leader in the solution towards climate change, rather than accepting the alms, or even worse, the “adaptation” loans so generously offered by the North. Climate change is not the struggle of white middle class Northern “post-material” environmentalists, it is a practical Southern issue because this is where the immediate impacts will be felt. In this context, keeping the Yasuni oil in the ground indefinitely is a sensible and forward-thinking initiative originating in the South. Fourthly, in Yasuni or wherever else, extracting and selling petroleum is not a continuous source of income: it is liquidating an inheritance built up over millennia. Extracting the oil means sacrificing future income, especially if one takes into account the fact that in 20 or 30 years the price of oil will rise as we approach the peak of Hubbert’s curve, with daily extraction reaching some 100 million barrels per day. While oil prices rise, the value of shrinking biodiversity will also rise, as will the urgency of greenhouse gases reduction. There are many uncertainties inherent in calculating costs and benefits in the distant future, so that Ecuador’s decision can only be taken with the short-term costs and benefits of oil exploration in mind. It is in principle a decision that is taken for forever. Oil exploitation from Yasuni would yield a positive financial revenue because the externalities are not factored into the accounts. The preservation of Yasuni benefits all of mankind. It is for this reason that Ecuador is asking for compensation. Without considering the local and global externalities, the Ecuadorian state would receive 10 or 15 dollars US for each barrel. (This is the market price minus the cost of extraction, transport and the profit of the oil company.) In a spirit of cooperation, Ecuador is only asking for 5 dollars per barrel. A fund of 4.6 billion dollars (920 million barrels at 5 dollars each) would give an annual yield, at 7.5% interest, of 350 million dollars annually. This money would either go towards the reduction of Ecuador’s external debt ($10 billion US) or towards other initiatives. In exchange Ecuador prevents the destruction of one of the most important sites of biodiversity in Amazonia, it prevents deforestation, the loss of culture, human lives, and it avoids emissions of some 111 million tons of carbon (120 kgs for each barrel of oil extracted). This trust fund of 4.6 billion dollars will be collected in two or three years, within President Rafael Correa’s term of office. The indefinite moratorium will be assured by a legal agreement and by international safeguards. Assume a donor was to contribute 460 million dollars to the fund, he or she would be able to claim 11 million tons of carbon emissions avoided, plus a certain amount more for avoided deforestation. The price of a ton of carbon would be a little over 40 USD. It is easy to argue that Ecuador should extract the oil and sell it to grease the wheels of its economy and the world, and that some future agreement regarding the absorption or mitigation of carbon dioxide produced will later be signed and sort out the problem. But such a perspective ignores the urgency of reducing global emissions now and it also ignores that the main goal of the proposal of leaving ITT undisturbed is the preservation of biodiversity, the forest, the water, culture and life itself. The avoidance of carbon dioxide emissions is an ancillary benefit. Donations to the trust fund will work towards two ends — reducing the external debt and to contributing to the Ecuadorian government’s budget used to protect Yasuni and its indigenous inhabitants. The fund will also go towards socio-environmental investments in other regions of the country, including support for wind, geothermal and solar energy, new schools, new houses, and new public energy efficient transportation, the development of capacities in eco-tourism and other priorities established in Ecuador’s recently established national plan for development. Professor Joan Martinez-Alier of the Universidad Autonoma de Barcelona is currently working with the Governmemt of Ecuador developing supporting data for the Yasuni project. 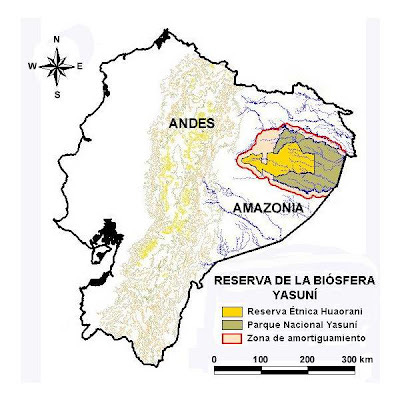 More information on the Yasuni proposal is available at www.amazoniaporlavida.org (Spanish) and www.sosyasuni.org (English). Thanks to Oilwatch for submitting this article to Climate and Capitalism.